The June/July issue of SA Angler magazine features many popular fishing locations and techniques, as well as ‘live’ action on big offshore sportfish like samsons and kings. 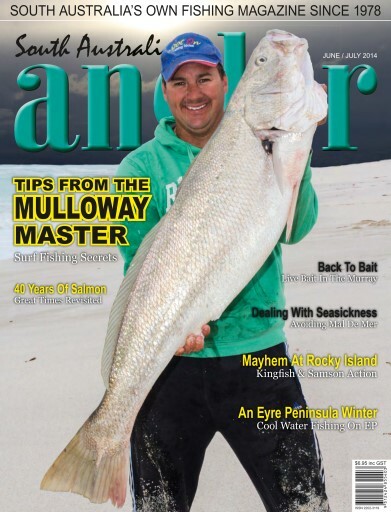 There’s also plenty for the keen surf fisherman, and particularly the mulloway enthusiasts. Tom Tierney’s feature entitled “Tips from the Mulloway Master” is probably the most comprehensive guide to surfline jewies ever written. We feature another a step-by-step guide to tying another useful knot – the Home Rhode loop, test a couple of great new boats and look at the wonderful world of downriggers. This issue has something for every angler, regardless of age or level of experience. It’s a truly great read!